In the 14 seasons he has been with the Red Sox, Jason Varitek has watched it happen to almost every pitcher he has handled, from brash rookies to veterans who believe they have seen it all. They arrive in Boston confident in their abilities and are soon smacked in the face by the realities of pitching in the American League East. Six months later, John Lackey understands. The righthander, who spent a relatively placid eight seasons with the Angels, is coming to the end of his first season with the Red Sox and now admits he had to make more accommodations in his new surroundings than he ever expected. The rewards of that work may not come until future seasons. But Lackey was able to walk out of Fenway Park smiling last night after throwing seven strong innings in a 6-1 victory over the Baltimore Orioles. Lackey (13-11) allowed one run on five hits and struck out four without a walk. Of his 111 pitches, 74 were strikes. On a night when David Ortiz homered and drove in four runs, manager Terry Francona came away most impressed with the work of his starter. “He stayed in command of the game. He made pitches all night. He really did a good job,’’ Francona said. Lackey retired the first 10 hitters in order, allowed a run in the fourth inning, then finished with three shutout innings. The revitalized Orioles, who had won 12 of their last 16 games, advanced only three runners as far as second base when Lackey was on the mound. 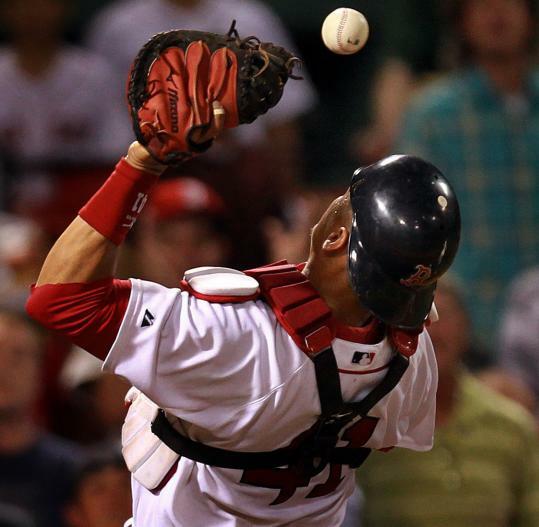 This was the pitcher the Red Sox invested $82.5 million in, not the pitcher too quickly derided as an expensive bust. Since the start of the season, Lackey has improved both the command and velocity of his fastball and developed a reliable cutter he can use as an out pitch. The process left him with a 5.23 earned run average against teams in the division. Going into last night’s game, Lackey was 0-4 with a 5.47 ERA in his previous four starts and had not won since Aug. 23. There have been many nights when the frustration was evident, even if Lackey didn’t always admit to it. He is counting on those experiences to make him a better pitcher with the Red Sox. “I think it’s going to do nothing but help,’’ he said. Not that there’s much choice. “Our division’s not going anywhere unless they realign. We play who we play,’’ Francona said. Ortiz was 2 for 3 with a three-run homer, an RBI single, and a walk. Victor Martinez and Ryan Kalish also had two hits against Kevin Millwood (3-16), who matched Joe Saunders for the most losses in the majors this season. The victory averted a sweep at the hands of the last-place Orioles, and evened the season series at 9-9. The Red Sox, who are off today, start a three-game series against the first-place Yankees in New York tomorrow. Down 1-0, the Sox scored three runs in the fourth inning. Kalish and Martinez had singles before Ortiz lined a breaking pitch into the Sox bullpen in right for his 31st home run. The crowd, sleepy to that point, came alive. The Sox made it 4-1 in the fifth inning on a home run to right field by rookie Josh Reddick, his first of the season. Millwood started the sixth inning but couldn’t record an out. Singles by J.D. Drew, Martinez, and Ortiz made it 5-1. Ortiz’s line drive to right field gave him 96 RBIs, three fewer than he had last season. David Hernandez replaced Millwood and Adrian Beltre lashed his third pitch into left field for an RBI double. Beltre has 46 doubles, a career high. He is one RBI short of 100. Ortiz has not driven in 100 runs since 2007, when he had 117. He has 10 games left to get there. Lackey, who has two starts left, said a good finish to the season will not ease the disappointment of missing the postseason.